This was on the main Google home page in place of the ordinary Google logo. Initially, the Turing machine runs a binary counter program, and will stop after a while unless you move the mouse. 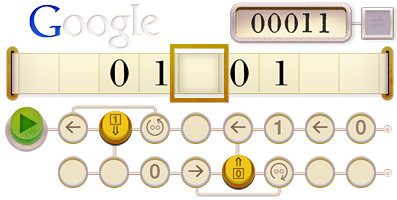 It will count until you click the round green "Play" button to play the Turing puzzle game. It gives you 6 "easy" Turing programming puzzles, which you solve by pushing the yellow buttons to set certain program steps, then press Play to see if you got it. If you've solved the puzzles and start over (or reload the page, or perhaps either) it gives you 6 "hard" puzzles. 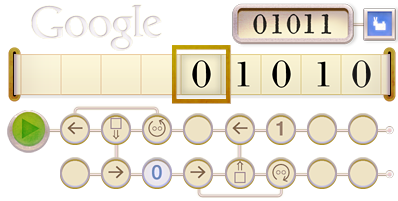 After working through the normal puzzles, the Google Doodle starts replaying the solutions of the Turing puzzles, and the "=" box in the upper right changes to something that looks like a little dog, or maybe the Trojan Rabbit from Monty Python and the Holy Grail1, on a colored background. at step 1: 1 at step 2: _ at step 4: _1 at step 6: _10 at step 9: 110 at step 11: 1_0 at step 14: 1_01 at step 16: 1_010 at step 20: 11010 at step 22: 11_10 at step 26: 11_101 at step 30: 110101 at step 32: 110_01 at step 36: 110_011 at step 38: 110_0110 at step 43: 11010110 at step 45: 1101_110 at step 50: 1101_1101 at step 55: 110101101 at step 57: 11010_101 at step 62: 11010_1011 at step 64: 11010_10110 at step 70: 11010110110 at step 72: 110101_0110 ... at step 87: 1101011011010 (len = 13) ... at step 186: 110101101101011010110 (len = 21) ... at step 407: 1101011011010110101101101011011010 (len = 34) ... at step 937: 1101011011010110101101101011011010110101101101011010110 (len = 55) ... etc. I'm counting head movements and writing or erasing a symbol as "steps". When a 0 or 1 symbol in the middle gets erased, it always replaces it with the same symbol again. Thus it makes sense to ignore these temporary erasures and just look at the whole binary string. It grows only to the right, and it's an irregular pattern. As the pattern grows, the successive values are 110, 11010, 110101, 11010110, 110101101, 11010110110, ... or in decimal: 6, 26, 53, 214, 429, 1718, 6874, 13749, ... which is not presently in the OEIS (even just the first 3 terms give no match). As shown (by the highlighed 01 digits) every now and then a couple digits in a block of 55 changes. It does not change with every block of 55, though. Also, it takes quite a while before the original row appears again (however, that particular set of 55 bits occurs very often, just not starting in a position that's a multiple of 55). In general, any initial substring no matter how long (and not just for Fibonacci lengths like 55), occurs arbitrarily many times in the rest of the digits, but the occurrences are irregularly spaced. The number doesn't fit any simple algebraic formula; my RIES program finds nothing 2. I got nothing with ISC+ either3. I sent most of the above to the seqfan and math-fun lists to solicit input and ideas. After finishing L2, it always moves right one space and then goes back to the "start"
After finishing L4, it always moves right one space and then goes back to the "start"
and finally, at the "start" is a test to see if the current spot contains 0 or 1. If it contains 0 it erases the 0 and goes toloop L3, and if it contains 1 it erases the 1 and goes to loopL1. However, since L2 goes back and replaces the 1 that was erased,and likewise L4 goes back and replaces the 0 that was erased, allerasures are temporary and we can just pay attention to what gets appended at the end. Start with a single 1 on an otherwise blank infinite tape. Starting on that single 1, scan from left to right one symbol at a time. For each 1, add 10 to the end. For each 0, add 1 to the end. 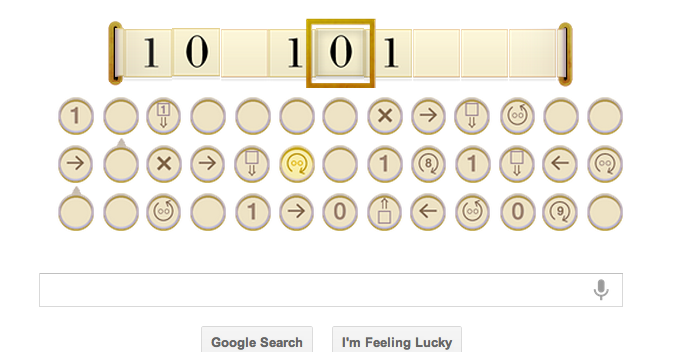 If you add an initial 1, these bits are exactly the same as the sequence produced by the Google Turing machine. 1 : The Trojan Rabbit Okay it's not that close a resemblance, but I couldn't resist. 2 : 0.839213771445165 gives these equations on the online RIES server; I also did a much longer RIES run on my own machine. 3 : ISC plus I might have been using ISC inforrectly. I think you need to try different numbers of digits: if 0.83921377144516 finds nothing, try 0.8392137714451, and so on.